NASA astronaut Mike Hopkins looks to the camera during his first spacewalk on Dec. 21, 2013. Two astronauts on the International Space Station are set for a Christmas Eve spacewalk tomorrow (Dec. 24). NASA astronauts Rick Mastracchio and Mike Hopkins will don their spacesuits and float out into the weightless wonderland of space for another spacewalk to repair the orbiting outpost's critical cooling system Tuesday. This EVA (extra-vehicular activity, or spacewalk) is the second in a series of spacewalks quickly planned after a problem with the vital system arose on Dec. 11. NASA astronaut Rick Mastracchio stands on the International Space Station's robotic arm during an urgent spacewalk to fix the station's vital cooling system. "We are not working any possible conjunctions or avoidance maneuvers for a sleigh being pulled by reindeer and occupied by a jolly man with a beard and a red suit over the next two days," NASA spokesman Rob Navias joked of Santa Claus today (Dec. 23) on NASA TV. "The skies are all clear." During the first spacewalk on Dec. 21, Hopkins and Mastracchio got ahead of their tasks and removed a faulty pump module in one of the station's two cooling loops, storing it on the outside of the station. Because they jumped ahead of schedule, the spacewalkers completed about two hours worth of tasks designated for the second walk. For the Christmas Eve spacewalk, Mastracchio and Hopkins will work to install a new pump module to replace the one they removed during the earlier walk. Some non-vital systems have been powered down since the problem began, but the replacement should get the cooling system back up and running, NASA officials have said. This will be Mastracchio's eighth spacewalk and Hopkins' second. Initially, Mastracchio was going to do his work while attached to the space station's robotic arm throughout the second spacewalk, and Hopkins was going to get to work while attached to the arm during the third. However, because the third spacewalk might be unnecessary, Hopkins will work on the robotic arm while Mastracchio free-floats during the Dec. 24 spacewalk. "Because it's apparent now that we'll be able to get most all of our critical objectives done on our next EVA — which is going to be tomorrow — there was some thought from both the crew and from the ground here that it would be good to get Mike [Hopkins] some experience flying in the arm," NASA's Judd Frieling, lead flight director for the station's Expedition 38 crew, said. "We went ahead and swapped roles between the crewmembers." 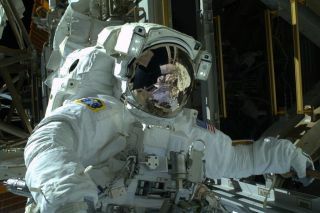 The Christmas Eve spacewalk was initially scheduled for today (Dec. 23), but after water may have entered Mastracchio's suit when he returned to the airlock after the Dec. 21 EVA, NASA decided to delay the second spacewalk an extra day. The water issue is not related to the frightening incident that caused water to flood European Space Agency astronaut Luca Parmitano's spacesuit during a spacewalk in July, space agency officials said, but Mastracchio will be not be wearing that spacesuit on the second EVA. "We're going to dry that [Mastracchio's spacesuit] out properly," Frieling said. "It'll probably take on the order of a week to get that properly dried out, but there's no expectation that suit will be a 'no go' indefinitely." The spacewalks delayed the first official cargo mission of aerospace firm Orbital Sciences' unmanned Cygnus spacecraft. The robotic spacecraft was scheduled to launch toward the International Space Station on Dec. 19, but that liftoff will not occur before Jan. 7, 2014, NASA officials have said.